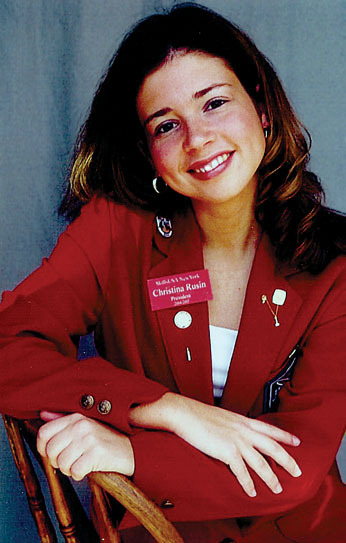 Christina Rusin knew she’d made it to the big leagues when she noticed then-national security advisor Condoleeza Rice walking up the stairs. But this wasn’t the time to be star-struck. Rusin wasn’t in the White House as part of a tour group. She had an important meeting to attend. That desire to stand out may be responsible for Rusin’s more-than-full plate. She is secretary of Union Springs (N.Y.) High School’s National Honor Society and enrolled in the computer information technology program at the Onondaga-Cayuga BOCES campus in Owasco. She’s SkillsUSA New York state president and vice president of her local chapter. She’s also a member of the National Technical Honor Society. To top it all off, she works part-time at a local Hallmark store. “It’s busy,” Rusin reflects understatedly soon after returning from SkillsUSA’s annual Washington Leadership Training Institute (WLTI). But even at WLTI, a jam-packed week in its own right, Rusin wasn’t content to simply follow the normal program. She saw an opportunity to make even more use of her time in D.C., and, in typical fashion, she jumped at it. Rusin’s sister-in-law’s cousin (got that?) happens to be Marlene Colucci, special assistant to the president for domestic policy. Using the influence of the admittedly distant family tie, Rusin was able to help arrange a meeting with Colucci at the White House during WLTI week, along with SkillsUSA Executive Director Tim Lawrence, her chapter advisor and her mother, Kathy Jo. Colucci, who hopes to bring Rusin back to the White House to speak with the president, agrees. “I came away from the meeting ready to sign up,” she says.